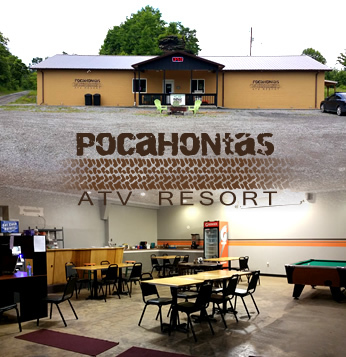 Pocahontas ATV Resort is located in Bramwell WV and smack dab in the middle of some great ATV trails! We have 11 cabins, two RV spaces, a bathhouse and a lodge where your entire party can get together after a day on the trails and share your adventures! The resort is very spacious with plenty of room for trucks and trailers. Come experience a resort where you can ride and relax in wild, wonderful West Virginia! These trails are some of the most beautiful and FUN trails in West Virginia. We are 3.2 miles from Pocahontas Trail Head (Hatfield McCoy Trail System). You can easily connect and ride Indian Ridge Trails and from there take a scenic connecter to Pinnacle Creek Trails. We are also 1 mile from the Original Pocahontas Trails (Spearhead Trail System) in Virginia. All of our staff knows the trail system and are happy to advise you on the best path to enjoy with your friends and family. Where you check in and check out. Bags of ice, cold drinks, chips and candy are available for purchase. Hatfield McCoy merchandise and our resort apparel available for purchase. Hatfield Mccoy Trail passes and Spearhead Trail passes available for purchase. Trail maps are available. Common area and public restroom. Tables and chairs for you entire party to gather after rides and share your trail stories or relax and play cards. If you forget something, no worries. Toiletries and towels are available for purchase. Firewood is also available for purchase to ignite that relaxing campfire at the end of the day. There is a car wash one mile away from our resort.